Talk about the differences among the children in the pictures – their faces, clothing, setting…and how they are all really the same. Daria shares music around the world and often teaches children how to make their own instruments. 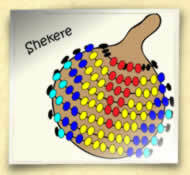 On her website, you will find instructions for making this shekere and many other instruments. There will be prizes galore! So don’t miss it…if you don’t want to enter, you can still have lots of fun, cheering on those who do and reading a whole bunch of amazing Halloween stories…last year she had over 100 entries! I hope everyone, especially my writer friends, will come back Saturday! Sandy, founder of BUILD BOOK BUZZ, taught me how to write a press release…and so much more…when my first book was published. She’s a well-spring of knowledge – as well as an incredible person. 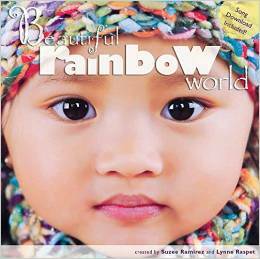 This entry was posted in National Diversity Awareness Month, Perfect Picture Book Friday and tagged Beautiful Rainbow World, Daria: Making Multicultural Music, Diversity, Lynne Raspet, Make a musical instrument craft, picture book review, Suzee Ramirez by viviankirkfield. Bookmark the permalink. Oh! This post has me singing and dancing! The universal language of music! Yes! Thanks for sharing all this Rhythm! Rhythm…you have an amazing sense of humor. 😉 Glad you love the singing and dancing…I wonder…do dogs bark a universal language? I know that dogs in Florida bark the same language as dogs in Texas. That’s about as universal as I’m privy to. This looks like a great book and activities for so many ages! Thanks for sharing! Music can be enjoyed by every generation…that is true, Katey. 🙂 Glad you liked the book. Wow. Great post. And I enjoyed Daria’s website. Thanks so much. Oh, the beads around the house! Both of my kids made shekeres in elementary school (we still have them!). Sounds like a perfect gift for a Montessori classroom I know! Thank you so much for introducing us to Daria. I love her music and book. Checked out her site. Music is such a universal and healing language. Perfect for National Diversity Month. Will look forward to following her! Thanks, Pat! Daria is one of those special people who just wants to share her gifts with the world…she definitely has her finger on the need to raise awareness of diversity…and she does a stellar job! Thanks for sharing. Can’t wait to check out her site, Vivian. What a great concept because the world is a rainbow. Always has been and always will be. And music is our universal language. Wonderful interview! And this book sounds very special indeed. I’m glad you’ve introduced us to it, and to Daria. Thanks, Vivian! Thanks, Beth! 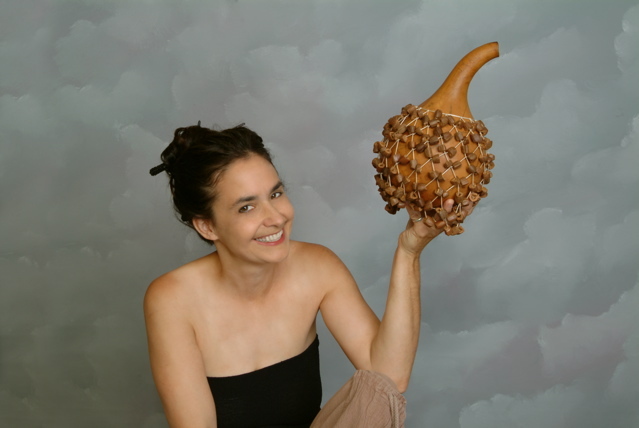 Daria’s website is an amazing resource for parents and teachers and kids…I love her! Dear Friends, Daria here with thanks to you all for stopping by. Vivian’s love of books plus her talent and encouragement make her a very special advocate for all of us who hope to make the world a little bit brighter, one child and one book at a time! This looks absolutely lovely – and cool that the lyricist stopped by! Thanks for sharing this one! What a beautiful book, Vivian! I’m sure the children’s faces are precious. And I enjoyed the interview. Thanks!